There are so many good reasons to retire in Bali. The Balinese are an enchanting people and their culture and religion is fascinating. Almost everyone speaks English which means there’s no language barrier and so daily life feels more relaxed. Plus, who wouldn’t want the conveniences of home, beautiful beaches, excellent shopping and delicious food for a fraction of the cost? Money stretches very far here, so you can live a luxurious lifestyle for pennies on the dollar. You could live in a two-bedroom, two-bathroom villa with a private pool for $400 a month! That leaves plenty of money for the little frills that Bali is known for…like lavish spa treatments or a snorkelling expedition. A household helper can be as little as $50 a month. Ubud and Seminyak are the most popular places with expats and tourists. Both of these areas have all the western amenities that you could think of, making fitting-in here a breeze. Ubud, which is a 30-minute scooter ride from Keramas beach, is the bohemian and art centre of Bali. It’s utopia for free-thinkers and those that might appreciate living outside of the box. If you want to learn to meditate, make silver jewelry or balance your chakras, then Ubud is for you. 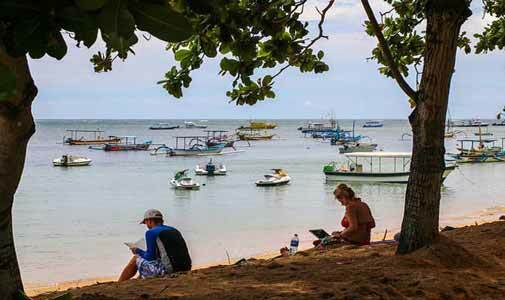 Sanur on the southeast coast is a small laidback town with calm waters and great restaurants. A pretty boardwalk along the beach makes this little city perfect for bike riding. Uluwatu is the surfing capital of Bali. It’s generally not for the beginners as the waves can get intense, but it’s perfect for a seasoned surfer that wants to live the old-school surf lifestyle and hone their skills. Lovina, on the north coast, has black-sand beaches where daily pods of dolphins can be seen frolicking in the water. It’s not a surfing spot but there’s great snorkelling and scuba diving on offer in the nearby waters. It’s small enough to know your neighbours but still has plenty to do to keep you occupied. Bali offers various types of visas—tourist, business, employment, social and retirement visas—each with their own set of rules and benefits. Requirements for the retirement visa include that you must be at least 55 years old of age, have proof of health and life insurance, proof of pension—a minimum of roughly $2,000 per month or at least $24,000 to provide living expenses while in Bali, proof of a rental agreement with the cost set at over $500 a month, a letter stating you agree to employ one Indonesian while you live there, an assistant, a household worker, etc., a C.V and a statement agreeing that you won’t work while in Bali. These rules and regulations can change so be sure to check for updates and additions. By acquiring this visa you’ll be able to stay in Bali for one year and renew for five more…but that’s not the only benefit. You can also open a local bank account and get a local driver’s license—although an International Driver’s License is also valid. Some restaurants, tourist attractions, parks and hospitals offer discounts to those with the visa. Once you have lived in Bali for five years or more, you can apply for official residence.